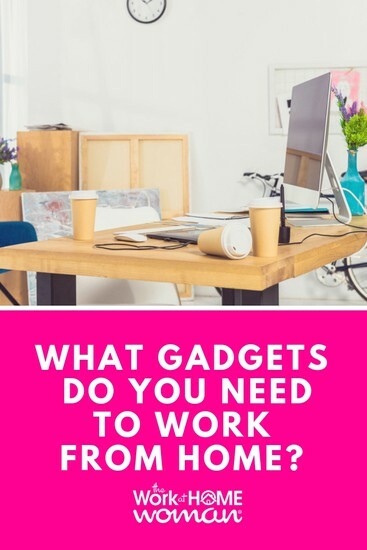 You are here: Home / Work at Home / What Equipment Do You Need to Work From Home? Today we're tackling a question from a reader about what type of equipment you need to work-from-home. If you've been wondering what kind tools and gadgets you need to work remotely — keep reading. What type of computer, internet connection, and equipment do I need for telecommuting or virtual English teaching? For most telecommuting jobs you’re going to need a well-functioning computer and a high-speed internet connection. While this sounds straightforward, there are a lot of little details that will need to be taken into consideration before you can apply or accept the position. Let’s take a closer look at what tools and equipment, you'll need for telecommuting. With any telecommuting position, you’ll want to check out the specific equipment requirements that they have. Usually, this information can be found in the job posting itself. While most companies will allow you to work on a PC or a Mac, there are a quite a few, mainly customer service and transcription jobs, that will require you to have a Windows operating system. So if you’re an Apple fan, like me, you’ll either need to look for companies that allow Mac computers or you’ll need to download Bootcamp which installs the Windows operating system on your Mac. The site, Work at Home Adventures has a great list of companies that let you use an Apple computer if you don’t want to download the additional software. If you don't have a computer at home, you may be able to go to your local library and use theirs for a short period. Most libraries will allow you to use a computer for one-hour if others are waiting, or a maximum period of two hours per day. Obviously, teaching ESL classes at your local library isn't going to work since they require patrons to be quiet. There are some work-at-home companies, that I know of, that supply free computers or equipment allowances for their employees, and I've listed those below. If I come across any others, I'll add them to the list. For many telecommuting positions, especially customer service and lead generation you’re going to need a landline. What this means is you’ll need to have service through a traditional or digital telephone provider. Cell phone and VoIP services like Skype, Google Voice, and Magic Jack are generally NOT permitted. Again, you have a couple of options. If you don’t have a landline, you can usually bundle this service along with your internet provider for a discounted rate. Or you can search for jobs where a landline isn’t required; Anna has a great list over at Real Ways to Earn. One additional note. Most companies will NOT allow you to take personal calls during your shift. If this is the case, you will need to have a dedicated phone line for working — which could be an added expense for you. Related Content: Do You Need a Business Phone for the Home Office? Many companies have minimum internet connectivity requirements that must be maintained to ensure proper functionality of their programs. A subscription to a reliable, high-speed (usually 3 – 5 megabits), hardwired, internet connection, like DSL or Cable is what most companies require. So, no dial-up or wireless connections. To make sure you comply double check the internet connection requirements listed on each employer’s job listing. If you don't have to be hardwired, and depending on your cell phone carrier and plan, you may be able to turn your smartphone into a mobile hotspot. There have been a few occasions where my home internet was down, and I had to use my mobile hotspot as a backup. Just be careful when you go this route — if you go over your data limit, it can get quite expensive. If you don't have an internet connection at home, you can head to your local coffee shop, library, bookstore, or shopping mall and use their wifi connections. Most establishments nowadays have free high-speed wifi for patrons. The downside of this is you'll be required to make a purchase which could be expensive if you are doing this daily, and these environments are not ideal for teaching ESL classes. As a last resort, you can try using a free internet service like FreedomPop or NetZero. For more information on free internet service, take a look at this article on how to get free internet legally. If you’re going to be doing phone work you’ll need to purchase ($25 – $100) a telephone headset. Since you’ll be wearing the headset for extended periods of time it should be comfortable — so don’t just purchase the cheapest one on the market. While wireless seems to be the way to go … most companies require a corded headset so that it can plug directly into your phone jack. Also, look for other requirements like, does it need to be noise-canceling? From what I’ve read online, the Plantronics S12 Corded Telephone Headset System seems to be the preferred set for telecommuters. For general transcription work, you’ll need to purchase a foot pedal and transcription software — which can often be bought together as a package. Once you download the software, you can control the speed of the audio with the foot pedal. I've never done transcription work, so if you’re looking for more information on this work-at-home career — make sure to check out expert transcriber, Lisa Mill’s interview. If you’re going to be teaching or tutoring, you may need video conferencing capabilities. Many laptops come with built-in cameras, so all you would need to to do is download is a video conferencing software like Skype, Google Hangouts, or Goober. However, if you’re using a desktop computer or if your laptop doesn’t have a video camera — you’ll need to purchase a webcam. Luckily, you can buy a nice HD webcam for as little as $25. Another must-have piece of equipment that you will need to work-from-home is a printer with scanning capabilities. While you may not use this a lot in your daily functions and tasks — you will need it for signing contracts, forms, and W9s. Don’t worry; you don’t have to spend a fortune to get a good working color printer and scanner. In fact, Epson makes a wireless, color printer, scanner, and copier for just $49.99. 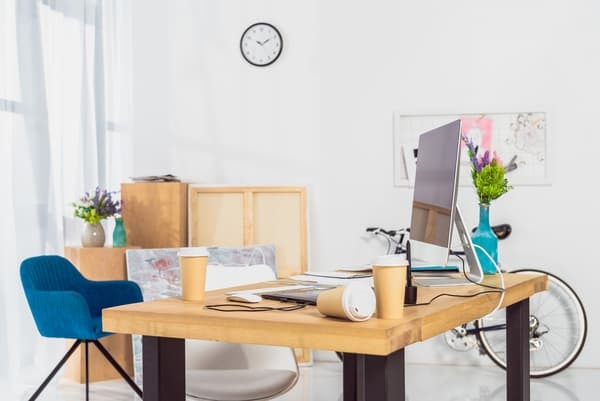 While you can work at your dining room table or kitchen countertop, if you're going to be talking on the phone or teaching on a video conferencing platform, you'll need a quiet place to work. And depending on your living arrangements you may need to set up a dedicated office space where you can filter out noises and distractions. Also, some companies require not only a dedicated workspace but also a door or a filing cabinet that locks to secure personal information from clients. What equipment did you need for your home office? What else would you add to this list? Drop us a note; we'd love to hear from you! If you enjoyed the post — please share it on your favorite social media site. Originally published April 10, 2015. Content updated January 15, 2019. That should be fine as long as all the software is up-to-date. Hi i want To start working from home i m interresting for the job . Hi Laterria, You can look for companies that provide you with equipment, or you can try making some money through side gigs or selling old stuff and then purchase the items that you need. Try looking at Dia & Co – https://www.dia.com/careers. Right now it says they’re hiring Stylists in Dallas; I would periodically check back to see if they hire Stylists in other cities. Also, check out these articles — they have some other options.